Woodland’s Jacob Flanagan expects Saturday to be his final organized football game when he plays in the Freedom Bowl Classic at McKenzie Stadium. After the summer, he plans on serving in the United States Coast Guard. Photo by Paul Valencia. Edited by Andi Schwartz. 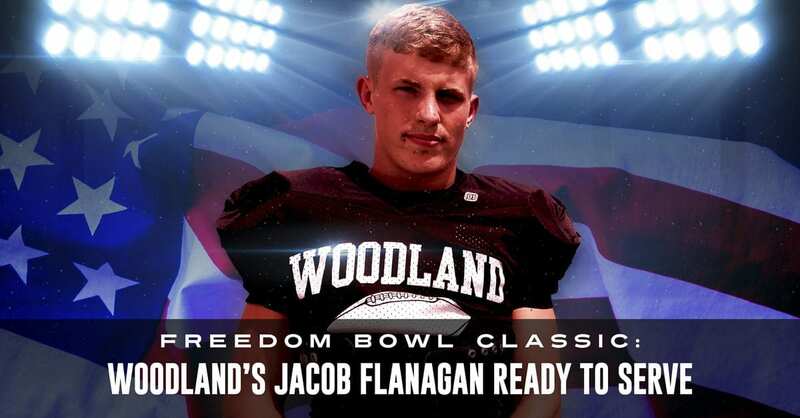 VANCOUVER — With the Freedom Bowl Classic on Saturday night, Woodland defensive lineman Jacob Flanagan has one more organized football game before he joins another team. In September, he hopes to be on his way to serving with the United States Coast Guard. Playing in a charity football game name named for freedom is special, too, he said. Flanagan is on the “West” team in a contest that will feature recent graduates from Southwest Washington. Kickoff is 7:30 p.m. Saturday at McKenzie Stadium. Proceeds go to Shriners Hospitals for Children. On Wednesday, players from the West and East were to join together to visit children who are patients at the Shriners hospital in Portland. “It’s so cool we get to hang out with those kids,” Flanagan said. And by the end of the week, they will share another opportunity. “One last chance to hang out with the guys and play football, a game we all love,” he said. Flanagan ended his high school career by helping the Beavers finish in a tie for second place in the 2A Greater St. Helens League. They made the playoffs for the first time since 2014 and just missed going to state, falling in the Week 10 playoff by three points. A chance to wear the Woodland helmet one more time was just too much to pass up for Flanagan. At Woodland football, it is not just about becoming better football players. Flanagan said the goal is to turn teenage boys into MOCs — Men of Character. “Become great men, even off the field,” Flanagan said. Which leads back to Flanagan’s decision to serve his country, then perhaps his community. “I’ve always thought of myself as a protector and a leader,” he said. Oh, and it is quite possible Flanagan will find his way into officer school. He wants to become a helicopter pilot. “I have always been fascinated with being in the air, everything aviation,” he said. Saturday, Jacob Flanagan hopes to give his teammates a lift. After this summer, he hopes so soar with the Coast Guard.